Share your cost savings ideas! Rather than using prepackaged, one-size-fits-all trays for medical instruments needed during delivery, members of BWH’s Labor & Delivery (L&D) and Materials Management teams realized it would be more cost-effective and less wasteful to create and provide customized trays for each patient’s delivery. The Bold Ideas, Big Savings program selected this as a winning idea, and the change was successfully implemented at the end of last year. It will provide an annual savings of $10,000. The Bold Ideas, Big Savings program committee recently visited the winning team members to present each with a certificate and $500 check. 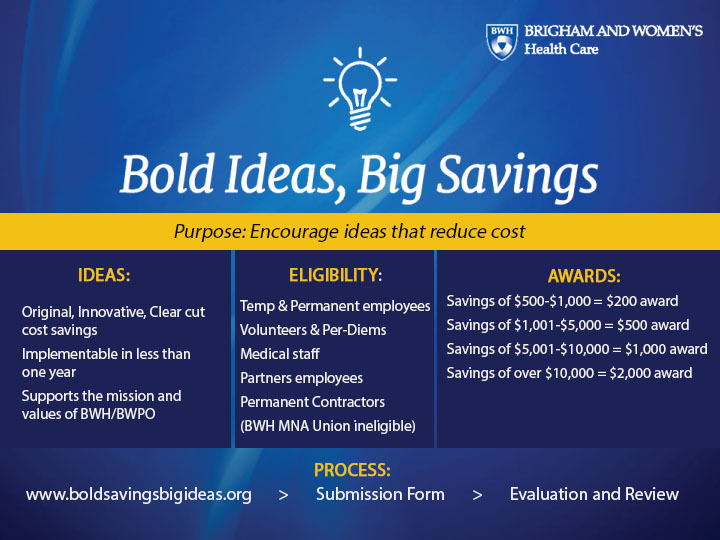 Learn more about the program and past winners, or submit your own cost-savings idea at boldideasbigsavings.org.